Holy smokes, that thing moved fast! In some surprising news, the Mike Frerichs Vortex (you guys remember it, right?) has another casualty on the campaign trail: Ann Callis and her long-shot bid for Congress. The DCCC has all but pulled out of the Callis race and those that are in-the-know are blaming the strong current of the Frerichs Vortex. Democrats have gradually narrowed their focus to protecting jeopardized incumbents and are likely to seriously invest in only the dozen or so candidates seen as realistic contenders for Republican-held seats. At the start of the cycle, for instance, national Democrats had been talking up the candidacies of Ann Callis, a former county judge running for an Illinois seat, and Amanda Renteria, a former Capitol Hill aide seeking a California seat. Neither candidate is now seen as likely to win, and neither is receiving as much attention. Beware other candidates. 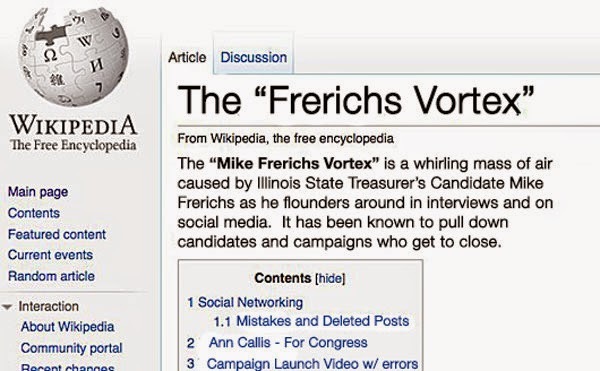 Don't get too close to Mike Frerichs or his vortex will take you down, too!